The Flash: What Does That Returning Character Mean For The Future? Spoilers below for The Flash Season 2 Episode 2. While The Flash can sometimes be criticized for its gee-golly attitude and cornball humor, it’s the closest a comic book TV show has ever come to actually reading a comic book, with each episode delivering just the right amount of thrills, character beats and clues to keep the long-term mysteries interesting. Tonight’s episode, “Flash of Two Worlds,” did just that, fully introducing viewers to Jay “Crimson Comet” Garrick and both Big Bad Zoom and Small Bad Sand Demon. 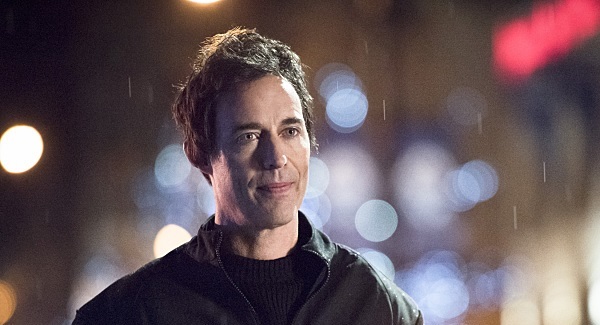 But the most exciting part came when Harrison Wells made his big debut as an Earth 2 citizen. Let’s look at the first example. On Earth 2, it’s possible that there was no Eobard Thawne to take over Wells’ body and persona, which means that the scientist in his original form (possibly also still married) was able to build his labs up as successfully as he could without any ulterior motives to train-and-then-destroy a speedster. So maybe this guy is just a really smart guy whose only guiding light is discovery and progress. He might be able to help everyone on Earth 1 in some way, and possibly has ties to Zoom. On the other hand, there’s nothing to say that the changes to Wells’ life on Earth 2 weren’t in other ways – perhaps a new affinity for Greek yogurt – and he’s still an Eobard Thawne-copy for some reason. Perhaps that guy is just a body-snatching douche in all 52 Earths. Could this second potential Evil Wells possibly have some reason to get to Earth 1 and blow people’s minds, as well as help Zoom? We need to get Cisco-as-Vibe on this case at once. A third option is that Wells is just a man with bad intentions that have nothing to do with anyone in the Thawne family. Knowing everything we knew about him last year, it’s hard to take any emotion on Tom Cavanagh’s face seriously, since it could just be hiding some other feeling. Maybe he’s vaguely smiling because he’s looking at the person who’s life he is about to destroy. Or maybe he likes being a philanthropist…of pain! It was also an episode where we met Iris’ mother, which should raise some interesting issues in the coming weeks. But we’re focused completely on Wells for the time being, or at least as much as the writers will let us. The Flash airs Tuesdays on The CW. Let us know what you think this Wells is about. What Do You Think Earth 2 Harrison Wells Is All About?